I kind of like the idea – I think a lot of Canadians could get into it. It’s fast, there are spills and chills, and while most of us have left our elite puck-handling days behind us, somewhere deep down inside a lot of us probably believe we could participate in a sport that rewards simple durability on skates. Heck, you even get to wear full hockey gear! But how does an average Joe or Jane get to become an extreme sportsman/sportswoman like that? Up until January 24th (11:59 pm EST) you can enter in a lottery draw to participate in one of 11 qualifying events across Canada, with winners going on to compete in Quebec City in March. And just in case, some entrants will win a trip to Quebec just to watch – so, worse comes to worse, you get a trip out of it I guess. If you want a taste, you can always tune into the live webcast of the Crashed Ice finals in Munich, tomorrow. Or have a look at this video from last year’s championship. 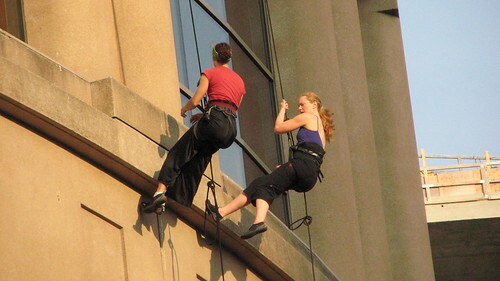 I was downtown outside of the Central Branch of the library when I, and pretty much everyone else on the sidewalk, spotted two women who began rappelling down the side of the library’s main building. After a moment they stopped and began doing a few acrobatic stunts, mostly flips. If anyone has the inside scoop as to who they are, and what they were doing let us know in the comments.